Identify three types of distracted driving and common examples of each. Identify techniques to share the road safely with distracted drivers. In 2015 3,477 people were killed in accidents involving distracted drivers. The purpose of this lesson is to heighten drivers’ awareness of the dangers of distracted driving and identify ways to stay safe when sharing the road with distracted drivers. Every day in the U.S., 9 people are killed and more than 1,060 people are injured in crashes that are reported to involve a distracted driver. The cause for concern is obvious. Transportation related occupational fatalities are the number one cause of death in the American workforce. Distracted driving is dangerous, yet increasingly common. According to the federal government, at any given daylight moment across America, approximately 660,000 drivers are using cell phones or manipulating electronic devices while driving, a number that has held steady since 2010. Engaging in visual-manual subtasks (such as reaching for a phone, dialing and texting) associated with the use of hand-held phones and other portable devices increased the risk of getting into a crash by three times. This phenomenon is called distracted driving. 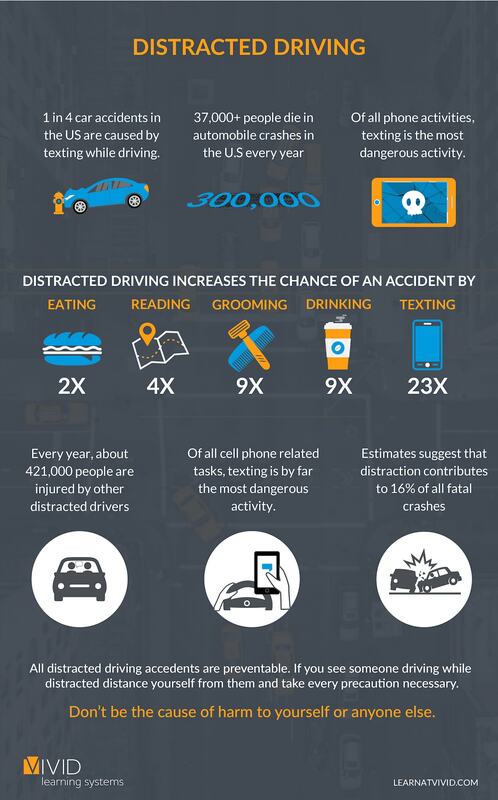 Distracted driving means driving while also engaging in an activity that takes the eyes off the road, the hands off the wheel, and the mind off the primary task: driving safely. Advances in technology lead all of us to think that it’s safe to multi-task with our devices (Blue tooth, hands free) while driving. In reality, the brain can only perform one task at a time, well. Driving requires the use of your hands, eyes and mind—it is a full sensory experience. Driving distractions can come in many forms. When we drive distracted, we physically and/or mentally impair our ability to make decisions and react correctly. The average time the eyes are off of the road while texting is 5 seconds, which is enough time, when traveling at 55 mph, to cover the length of a football field blindfolded. This is long enough for anything to happen to your car, like swerving into another lane and hitting a car, failing to slow down when traffic suddenly slows, or missing a stop sign. What techniques can we teach our drivers to use to remain safe when sharing the road with distracted drivers? A safe driver is one who is alert and drives proactively. A good habit to use is the 10-4 technique, where workers scan the road 10 seconds ahead of travel, maintain 4 seconds of following distance and scan all 4 sides of the vehicle for threats. This 10-4 technique will help drivers identify an at-risk situation, before it develops. That way, drivers physically cannot reach for distracting items, like cheeseburgers, cellphones, or magazines. On a single lane road, slow down to allow more distance between the vehicle and the distracted driver. A greater following distance means more reaction time for the driver and lessens the risk of being harmed by the distracted driver. Pull the vehicle over to the side of the road before calling for help or writing down the driver’s license plate number. If your driver believes that the distracted driver or others on the road are in imminent danger, they should strongly consider calling 911 after having pulled the vehicle over to the side of the road. Don’t attempt to drive next to the distracted driver to get his or her attention. This can easily put both drivers and others on the road in harm’s way. If riding in a car with a distracted driver, ask the driver to stop, but don’t argue with the driver, which could distract the driver even more and add danger to an already serious situation. View and print these safe driving tips. Always keep hands on wheel, eyes on the road, and mind on driving. Visit: distraction.gov for videos, brochures and more information about distracted driving dangers. Traffic Safety Notes, April 2013.